Welcome to Norecopa's first newsletter in 2019. Please share this with your colleagues and friends! 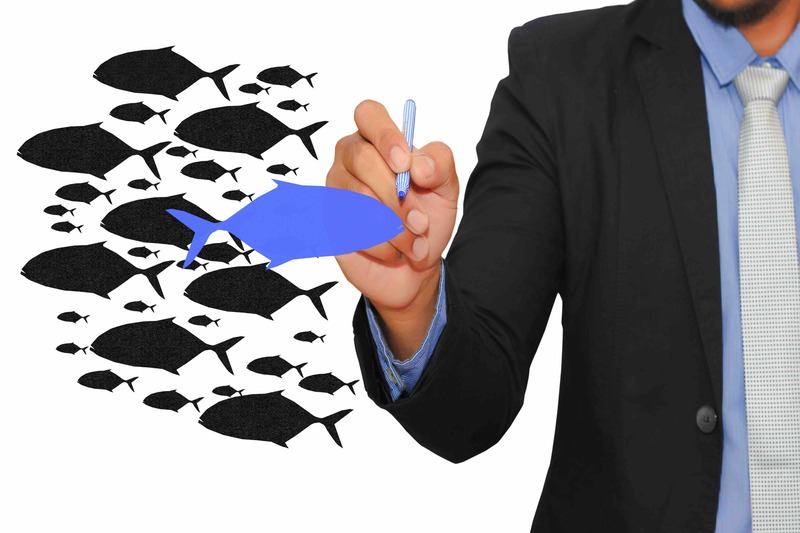 • Management or animal research? Norecopa's secretary frequently receives invitations to present on the PREPARE guidelines and 3R alternatives - so far this year he has booked trips to Japan, South Korea, Austria, Belgium, the Czech Republic, Denmark, Estonia, Finland, Sweden, the UK and in Norway. This newsletter is being sent from Oulu in Finland, where he has presented guidelines for planning and reporting animal research on a seminar in study design for medical researchers. He is also involved in the organisation of this year's major European congress on animal research and the 3Rs: the FELASA meeting in Prague, where he is an invited speaker and has submitted 6 abstracts. Norecopa's website received 175,000 pageviews in 2018, which is 30% more than in 2017, and the number of unique visitors increased by over 65%. A full Annual Report is in preparation. 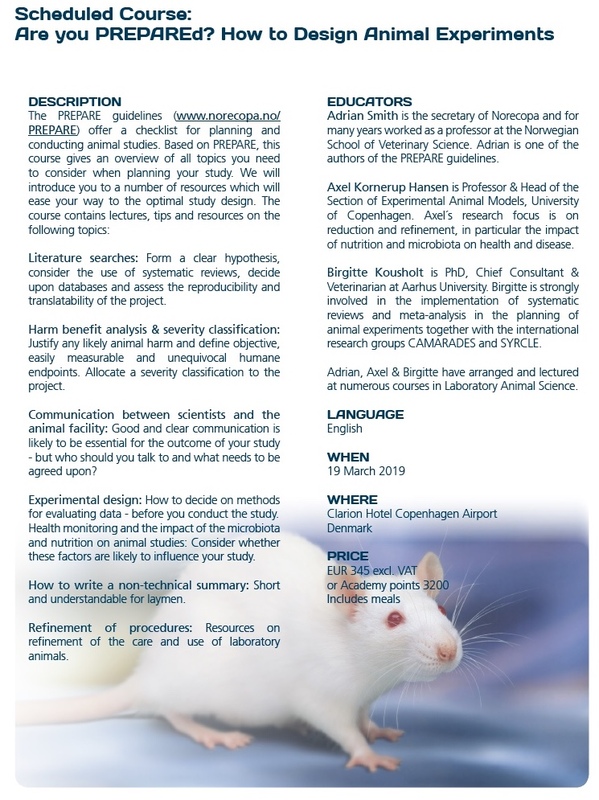 Please encourage colleagues to consider coming to Copenhagen on 19 March, when Norecopa, in collaboration with Scanbur Academy and other Danish colleagues, is arranging a one-day workshop on design of animal experiments, based upon the principles in PREPARE. This course is a landmark event for Norecopa, because the feedback we receive will be used to evaluate the need for similar courses in other venues. The course takes place at the Clarion Hotel Copenhagen Airport, which is just a couple of minutes' walk from the terminal building. The course starts at 1000 and finishes at 1700, making it possible for many to attend without having to spend the night. The Association for the Study of Animal Behaviour (ASAB) and the Animal Behavior Society (ABS) publish jointly guidelines for behavioural research each year in the journal Animal Behaviour. Norecopa's secretary offered to update the links in the guidelines. A new version has just been published. The PREPARE paper was the 4th most downloaded paper last year from the journal homepage, and has already become their 4th most cited paper during the last 3 years. It was downloaded over 7,400 times in 2018 from the Laboratory Animals webpage, in addition to downloads from Norecopa's website. 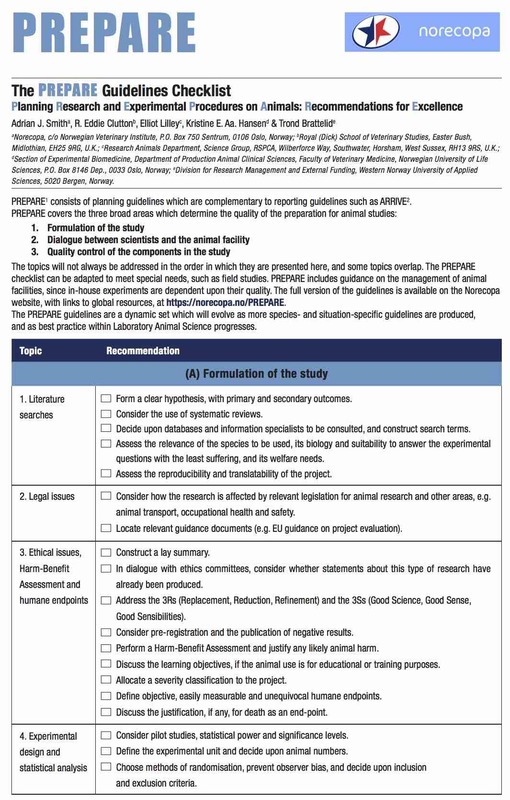 The Association for the Study of Animal Behaviour (ASAB) and the Animal Behavior Society (ABS) have taken the decision to endorse the use of the PREPARE and ARRIVE guidelines for planning and reporting experiments using live animals, and recommend that authors refer to these. Dutch scientist Henk-Jan Schuurmann gives his experiences with the 3Rs in an article in the magazine Laboratory Equipment entitled Between 3Rs: How PREPARE Can Reduce Animal Use. 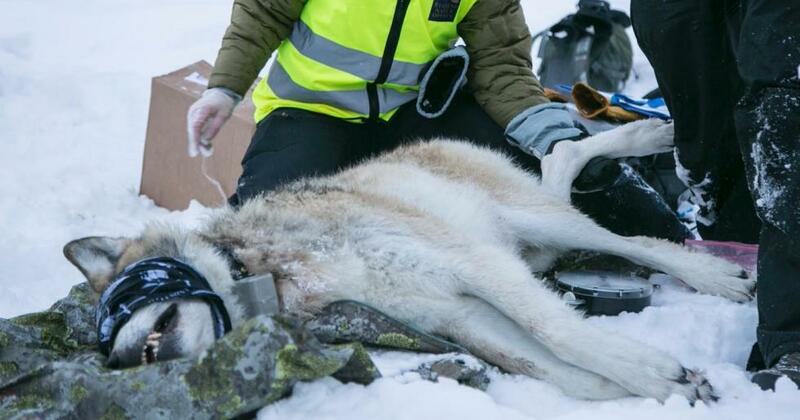 The EFTA Surveillance Authority (ESA) has closed a case concerning a complaint that GPS collars were fitted to wolves in Norway without the necessary authorisation from the competent authority (the Food Safety Authority, Mattilsynet). The case hinged upon whether this procedure, with the simultaneous collection of samples which may in theory be used later for scientific purposes, falls under EU Directive 2010/63. Article 1(5) (e) of the Directive states that 'practices undertaken for the primary purpose of identification of an animal' fall outside the scope of the Directive. ESA accepted the response of the Norwegian Government that the primary purpose of the GPS tagging was wolf management, and that the sample collection was not done within the context of any particular scientific or educational study, noting that the samples are, instead, accessible upon request and following a formal application. This issue was the subject of lengthy debate at Norecopa's international consensus meeting on field research in October 2017, and it is discussed in detail in the consensus statement produced by the participants. They concluded, among other things, that decisions regarding capture, marking and tracking of wild animals should be made with input from the central animal research authorities, irrespective as to whether this is for scientific purposes or for population management. Relevant to this case is a mini review entitled The dividing line between wildlife research and management - implications for animal welfare which has just been published by Johan Lindsjö and colleagues in Sweden. They point out the difficulties in defining the dividing line, and they conclude that both management and research procedures should be assessed by one Animal Ethics Committee. A recent publication by Arnemo and co-workers provides support for the need to share experiences in tracking wild animals. They have published a study of the long-term safety of intraperiteonal radio transmitter Implants in Brown Bears. The authors found evidence of poor biocompatibility and suboptimal technical quality, concluding that these implants should not be used in this species. Experience suggests that severity classification is still insufficiently harmonised within the EU. Even among experts, animal procedures are often evaluated very differently, judged by seminars on the topic. Consistent severity assessment and classification of procedures are essential for the ethical review process and for informing the general public about the harms inflicted on research animals. As a first step, Norecopa and co-workers are assembling a collection of severity classifications which have been published for use in Europe. We are initially focusing on severe discomfort, and harmful phenotypes of genetically altered animals. The overview will be made available on Norecopa's website on severity classification during the Spring of 2019. 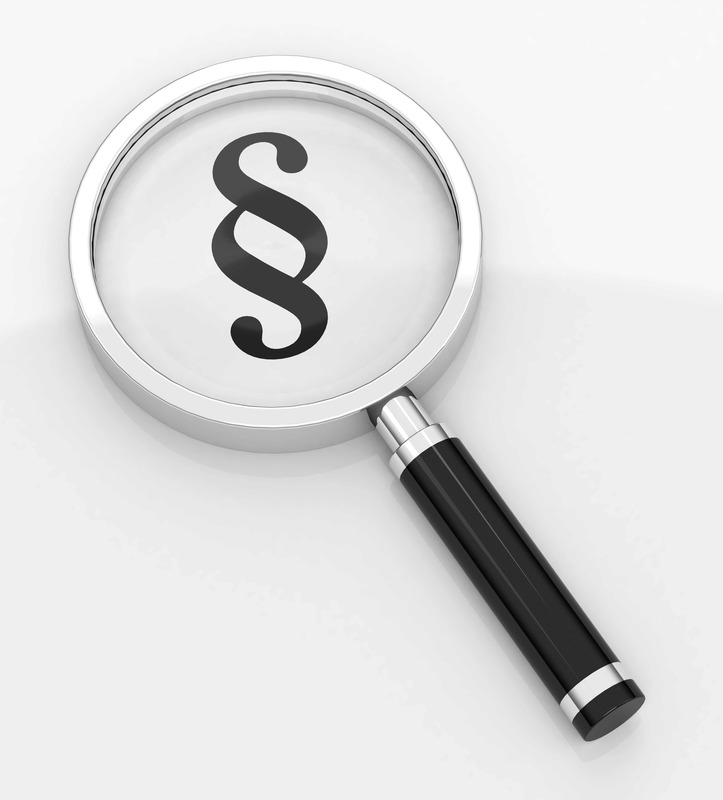 The overview will aid identification of areas where more research is needed, and will stimulate discussion so that additional information is submitted. This will hopefully lead to the refinement of the criteria used for severity classification. This work is a collaboration between Anne Zintzsch, coordinator of the new 3R Centre ICAR3R in Giessen, Jan-Bas Prins (Leiden University Medical Centre and the Francis Crick Institute) and Adrian Smith (Norecopa). Anne Zintzsch and coworkers published a set of guidelines in 2017, and she lectured on the subject at Norecopa's annual meeting the same year. 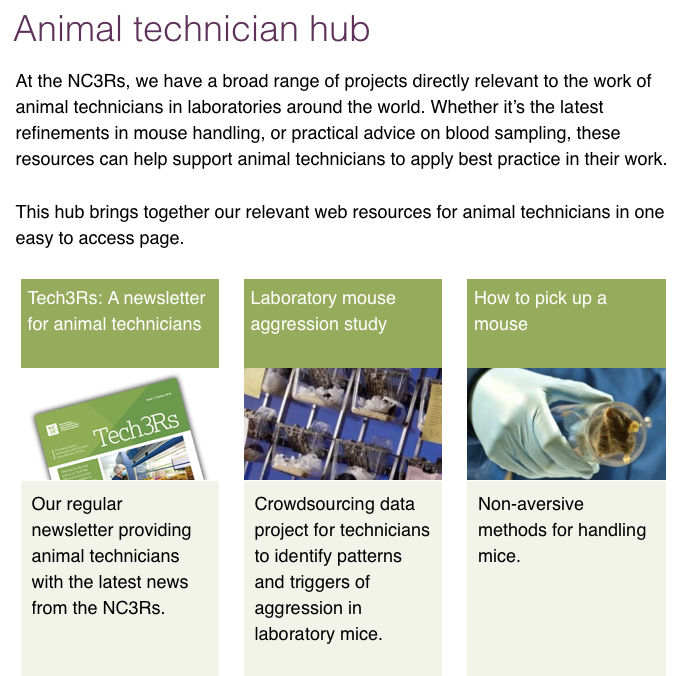 The UK 3R centre NC3Rs has compiled a webpage with relevant resources for animal technicians called the Animal Technician Hub. The page highlights, among other things, their newsletter for technicians, refinements of housing, handling and sampling, a link to their events calendar and e-learning resources. This week has been designated International Laboratory Animal Technician Week, to recognise the important contributions which they make to the quality of animal research and welfare. Animal Study Registry is an online global registry for scientific studies. It is operated by the German Centre for the Protection of Laboratory Animals (Bf3R) at the German Federal Institute for Risk Assessment (BfR). The registry was launched as a reaction to the reproducibility crisis and provides scientists a platform to register an exact study plan prior to the start of experiments in order to prevent selective reporting. This allows reviewers or other scientists to compare the initially registered contents with the final publication. The posters and many of the presentations held at the Danish 3R Center's annual symposium in November are now available online. The event attracted over 200 participants and was very well received. The next symposium will be held on 12-13 November, in Copenhagen. Registration has now opened for the ECLAM/ESLAV Summer School in Stockholm on Experimental and Surgical Techniques, Design and Conduct of Research, in June. Details of other educational and training opportunities are available on a special page on Norecopa's website. 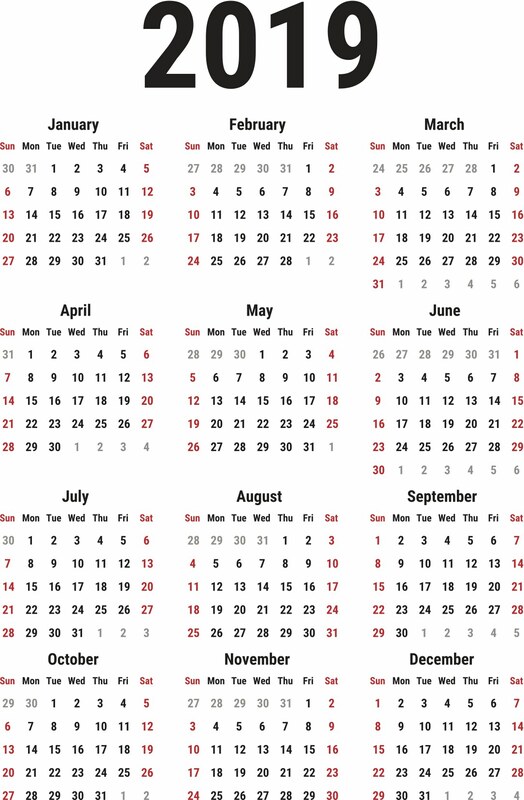 Many of the events highlighted in our International Meetings Calendar also contain such opportunities. Translational barriers between species form one of the major challenges in animal research and testing. A machine-learning model, called FIT (Found in Translation) has recently been developed, using statistical methodology to extrapolate data from gene expression in mice to the equivalent human condition. It is described in a paper in Nature Methods. Norecopa's secretary is second author of a mini-review entitled Nordic symposium on "toxicology and pharmacology without animal experiments - Will it be possible in the next 10 years?" The paper describes each of the Nordic 3R centres and includes a timeline of the development and implementation of alternative methods in this region. The Norwegian Research Council has recently allocated NOK 76.7 million within its programme on Aquaculture Research (HAVBRUK) to 10 projects, several of which are relevant to fish research, including studies on understanding and monitoring mortality, development of an in vitro system to study environmental factors influencing gill function, and optimisation of feed withdrawal. Scientists in the UK and Singapore have developed an infection model for tuberculosis using larvae of the wax moth (Galleria mellonella). A recent paper in Nature describes the production of human blood vessel organoids in the lab, which should prove to be promising in studies of diseases linked to the vascular system, such as stroke and diabetes. An article entitled Bivalves: A New Model for Biomedical Research? describes studies suggesting that marine and freshwater molluscs may be useful models for such diverse studies as tissue regeneration and immunity to infections. The debate on whether or not fish perceive pain continues. In the January issue of the ICES Journal of Marine Science, Howard Browman and co-workers have published a paper entitled Welfare of aquatic animals: where things are, where things are going, and what it means for research, aquaculture, recreational angling, and commercial fishing. In the same issue, Ben Diggles provides a review of some scientific issues related to crustacean welfare. Both papers argue that flaws in studies on aquatic species can lead to restrictions on research which may exceed any benefits to their welfare. On the other side of the debate, as mentioned in our previous newsletter, Lynne Sneddon and co-workers present what they consider to be shortcomings in the arguments used in the debate. In a separate paper, Sneddon asks whether the age of protection for zebrafish should be lowered in the light of recent research findings. An additional issue in this debate has been generated by German scientists who believe that one fish species has passed a classic test of self-recognition, which even most primates fail. A number of other important papers on fish have been published since Norecopa's last newsletter. Tânia Martins and co-workers a review of anaesthetics and analgesics used on adult fish in research. Toni and coworkers have published their assessment of fish welfare in research and aquaculture, with a focus on the European directives. One of their conclusions is that there is a general lack of information on optimal environmental conditions for the range of species covered by the animal research directive 2010/63/EU. And finally, the organisation OneKind has recently published a review of cleaner fish welfare in Scottish salmon farms - some of this content is relevant to fish used for scientific procedures. 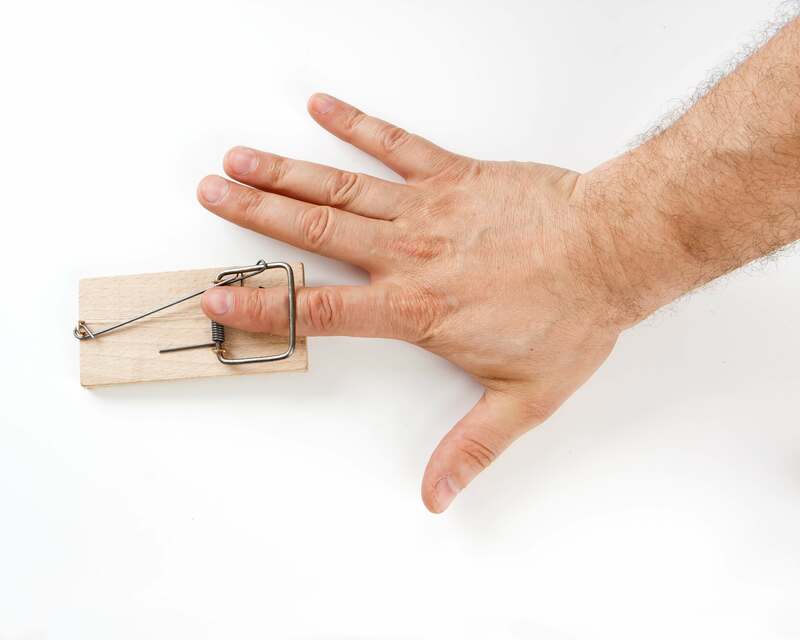 Kathrin Herrmann and Paul Flecknell have conducted a retrospective review of the application of humane endpoints and humane killing methods in animal research proposals sent to the German authorities. They concluded that, when the investigators included humane endpoints in their application, these were often lacking in detail and/or were to be implemented at a late stage of suffering. In addition, the choice of method to kill the animals could be improved in the majority of the applications. 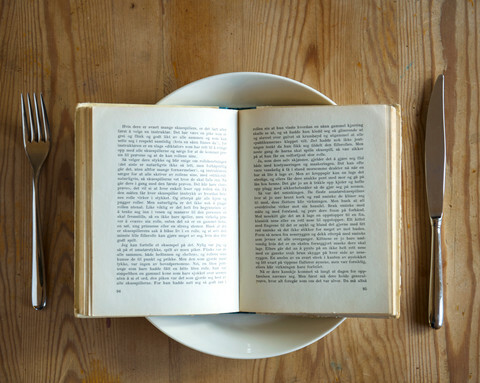 The authors recommend greater use, and publication, of such retrospective reviews. In a letter to Nature, Anton Bespalov and colleagues argue that industry is more alarmed about reproducibility than academia. They claim that industry and academia have different yardsticks for research: academics may be less inclined to spend time repeating experiments in case they fail. Collaboration between scientists in private and public sectors is often essential for translation from animal models to human medicine. In the journal PLOS Biology's XV Collection (marking 15 years of open science), Jonathan Kimmelmann comments upon an earlier paper by Vogt et al. on failings related to the authorisation of animal experiments. Both papers are well worth reading. Laboratory mice are normally housed at a room temperature which is well below their thermoneutral zone. Recent studies using heated cage floors show that mice have lower heart rates, indicating less cold stress, when offered warmer cages. In a contribution to the debate on the perceived reproducibility crisis, Bernhard Voelkl and Hanno Würbel suggest that we should focus more on the reaction norm concept, which explains observations that animals of the same genotype can react differently under different environmental conditions. Therefore, the attempt to improve reproducibility through rigorous standardization of both genotype and environment has been referred to as the ”standardization fallacy”. The Autumn 2018 issue of the magazine of the Society for Experimental Biology has a feature entitled Animal Welfare and Science: Two Best Friends, reporting the discussions at their annual meeting. The Norwegian National Research Ethics Committees have published an article (in Norwegian) describing seven common errors when performing statistical analyses. The ORION training team has developed a step-by-step checklist for researchers to assess whether they should improve their open science practices in their day-to-day research.